Forget Android or Windows 8. Someone decided to install a Mac OS on a Nook. 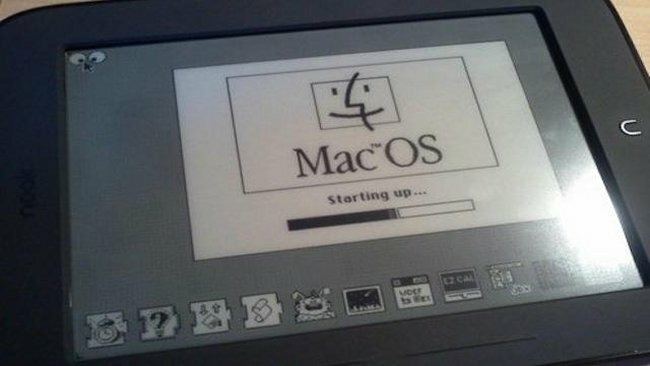 A 16-year-old version of Mac OS. On a newer device. Granted, the Nook Simple Touch is not a high end tablet, but it is modern. So now this person knows what it would be like to have a Mac OS tablet as if it were 16 years ago were. It was done by members of the 68k Macintosh Liberation Army forums. It looks funny on a tablet for sure. And though the Nook Simple Touch has the hardware power to handle it, this is just an experiment to show that it could be done. And now we know that it’s possible. It may not be practical, but it is possible.